Although I have 100 built boards from the manufacturer, I am only getting about a 40% yield out of the box. It took me over a day to figure out what was going wrong. 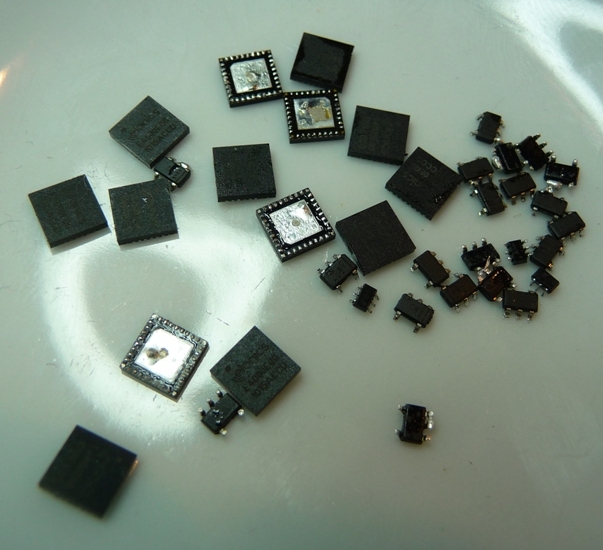 It turns out that about half the 1.5V low noise voltage regulators from the assembler are failing. These provide power for the tuner chip (two separate ones to reduce noise). To make matters worse, their failure mode is to throw the USB 5V directly onto the tuner chip, which itself promptly fails short circuit to ground. So I spent quite some time figuring out what was going wrong. At first I thought it was shorts under the QFNs due to the secondary failure mode. Then after replacing the tuner chip, measuring no short, applying power, ***PING***, blown up another tuner chip, something else was wrong. Turns out to be about half of these regulators. The marking on the regulators looks fine. Specific date/batch codes are not an indication of failure either. As luck would have it, I can isolate the power to the tuner by removing five chip inductors, test for the failure, replace the offending regulator(s), replace the inductors and away we go. But I have to do this on *every* unit. I’ve now fixed twenty-six, and I estimate this to be another 1.5 days’ work. That’s horrible! Sorry to hear that you’re having so many problems with the manufacturing process, but I am quite impressed and thankful that you are taking quality control so seriously! In the day and age where nothing lasts more than a couple of years, your attention to detail and pursuit of quality are refreshing! You have earned a customer for life right here. Rest assured, your hard work and dedication to customer service does NOT go unnoticed, and the community as a whole is grateful for your incredible efforts. Keep up the great work!! and detect the failure before the volts get excessive. Good idea, and I had tried that… trouble is, the regulators trip in at about 2.3V, and that seems enough to trash the tuner chip on one of the two rails, so I am just plodding along the hard way! The total bad chip count for the first batch was six, either due to bad sensitivity (LNA repleaced) or bad image rejection (tuner replaced). No bad regulators at all. How can ESD diodes go bad?!?!? Rest assured, I will be doing all the procurement myself from now on. I have three FCDs that have other faults, one of which is irrepairable due to PCB tracks being lifted (not by me on this occasion!). Howard, you seem to have some manufacturing issues, that can be solved by our team of experts. I would be looking at your assembly process, the uses of a decent screen printer and P&P aso vapour phase oven. We have a UK parent in Manchester that may be able to help. Larger capacitors might help reducing excessive voltage spikes.